Over 130,000 companies are already using these persona templates to align their marketing, sales, and product design teams. It's important to establish buyer personas for your business so you can segment your audience and create stronger marketing campaigns. But how do you start researching and creating these buyer personas from scratch? Our free, customizable buyer persona templates will let you easily organize your research to create your very own buyer personas. If you market with buyer personas, you are marketing smarter. And it's so simple that you can start today! With these templates, you can learn best practices for persona research and create beautiful, well-formatted buyer personas that you can share with your entire company. How can you use personas? How do you create personas? How well do you really know your ideal customers? You won't be able to position what you're selling to meet customers' (and potential customers') needs without knowing who they are. How well do you know your ideal customers' backgrounds, their goals, and their challenges? How well do you understand their interests and needs? Do you know how old they are? Where they went to school? Whether they have kids? What a day-in-the-life looks like? Creating very specific buyer personas can dramatically improve your business results. Without knowing the answers to questions like these, it's difficult for a business to create an effective strategy to attract, sell to, and delight more of those types of people. In order to grow, you need to understand your ideal customers inside and out and integrate that research across your entire business. Here, you'll learn all about personas in more detail: what they are, how you can use them, and how to create them. Keep scrolling and you'll find customizable persona templates you can use for your business, as well as persona examples to guide you. Finance Manager Melonie. Landscaper Larry. Caregiver Cassy. These names refer to personas: fictional, generalized representations of real people. By grouping people into persona categories, it's much easier for marketers, product designers, salespeople, and services people to tailor their content, messaging, product development, and services to different groups of people. You might have heard personas referred to more specifically as "buyer personas" or "marketing personas" by marketers, or even "customer personas" or "user personas" by product designers. Regardless who in your business is using them, it's important to remember that personas aren't just for marketing. They're not one of those one-off exercises your marketing team does, only to promptly forget about them several weeks later. Implement your personas across your entire funnel strategy, and let everyone in the organization know who they are -- from Marketing to Product to Sales to Services. Buyer personas are a key part of the inbound marketing methodology. Learn how to execute a holistic inbound strategy in a free online certification course by HubSpot Academy. Buyer personas are fictional, generalized representations of your ideal customers. They help you understand your customers (and prospective customers) better, and make it easier for you to tailor content to the specific needs, behaviors, and concerns of different types of buyers. The strongest buyer personas are based on market research as well as on insights you gather from your actual customer base -- through surveys, interviews, and so on. We'll get more into how to create personas later. Depending on your business, you could have as few as one or two personas, or as many as 10 or 20. You can use them to inform everything from writing more effective copy to developing better products. Don't have personas for your business yet? One of the hardest parts of creating those personas is coming up with all of the questions that will shape your persona research. 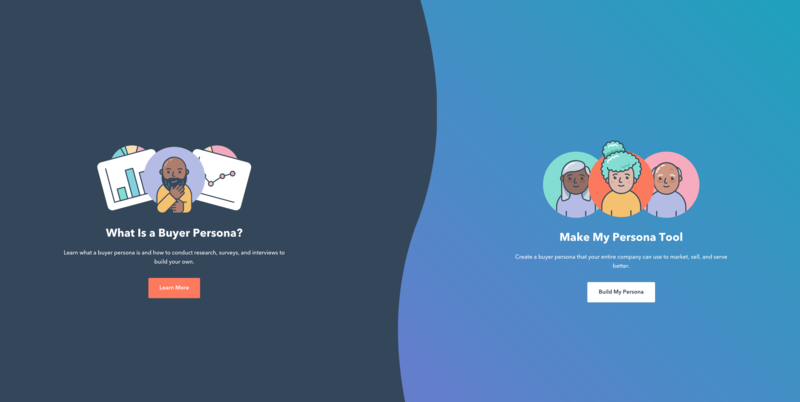 Before you spend time and money on research, use our free Make My Persona tool to easily create simple personas and share them with the rest of your company. Whereas a buyer persona is a representation of an ideal customer, a negative or “exclusionary” persona is a representation of who you don’t want as a customer. These are the people you don’t want to target. The fact is, some leads just aren't a good fit for your business. They may not have budget. They may be students who are only engaging with your content for research or knowledge. They may be too advanced for what you're selling. They may become a customer, but they were inordinately expensive customer to acquire. They may become a customer, but you never recoup the costs of acquiring them because of a low average sale price, their propensity to churn, or their unlikeliness to purchase again from your company. To identify and understand these kinds of people, you need to create a negative (exclusionary) persona. It may appear counterproductive to spend timing getting to know people who will never be your customers, but it'll save you and your team time and money in the long run, as you will not waste time marketing and selling to these people. One of the biggest challenges you might find yourself facing when creating buyer personas is knowing where to start your research. For your negative personas, a great place to start is by interviewing a sample of customers who closed but had a very low average sale price. You could also speak with some customers with low customer satisfaction scores, which might be an indication they were never really a proper fit for your company. Our guide on creating negative personas will walk you through the whole process. As you pick out some of your less-than-ideal leads and customers and learn more about them, you'll identify common characteristics and habits that will help you shape your negative personas. How can you use buyer personas? At the most basic level, personas allow you to personalize or target your marketing for different segments of your audience. For example, instead of sending the same lead nurturing emails to everyone in your database, you can segment by buyer persona and tailor your messaging according to what you know about those different personas. If you take the time to create negative personas, you’ll have the added advantage of being able to segment out the “bad apples” from the rest of your contacts, which can help you achieve a lower cost-per-lead and cost-per-customer (and see higher sales productivity). When combined with lifecycle stage (i.e. how far along someone is in your sales cycle), buyer personas also allow you to map out and create highly targeted content. 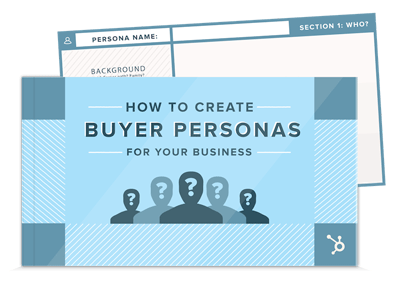 Learn how to use buyer personas and lifecycle stages to create targeted content. Our free content mapping template will walk you through the entire process. Buyer personas are created through research, surveys, and interviews of your target audience. That includes a mix of customers, prospects, and those outside of your contact database who might align with your target audience. Interview customers -- and potential customers -- either in person or over the phone, to discover what they like about your product or service. Ask questions about their job role and title, what a typical day-in-the-life looks like (both at work and outside of work), what tools they use in their job, what their challenges are, how they learn new information or acquire new skills, where they're from, how they search for information on the internet, and so on. Here's a list of 20 questions to ask during a persona interview to help guide you. Optimize forms for your persona. Talk to your sales team. Consider your sales team's feedback on the leads they are interacting with most. What types of sales cycles does your sales team work with? What generalizations can they make about the different types of customers you serve best? Bonus Tip: Start with one, core persona and build up from there. There should be clear differentiators between each one of your personas. Remember: The reason you're creating personas is so you can create an experience that resonates with each of them. This will lead you to having a far clearer picture of the persona your marketing should be targeting. Once you start to analyze the data based on your most successful customers, you'll start to see where one persona ends and another begins and it'll become much easier. Finally, be ruthless when creating your personas. If you don't have enough information on a particular persona, remove it. In fact, don't be afraid to add or remove personas over time. 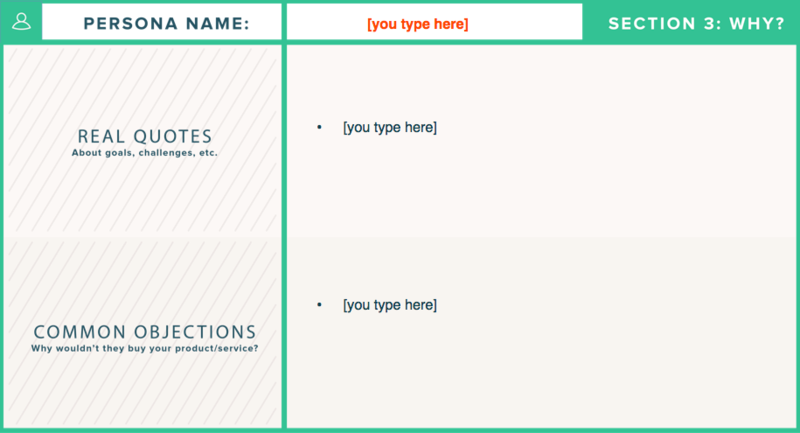 This short guide will help you understand how and when you should add or remove personas. Whether you're just getting started with personas or you've already begun your research, use these templates to help you focus, simplify, and streamline your persona development. Here's an example of a persona we created using the buyer persona templates you can download above. We'll call her Sample Sally. 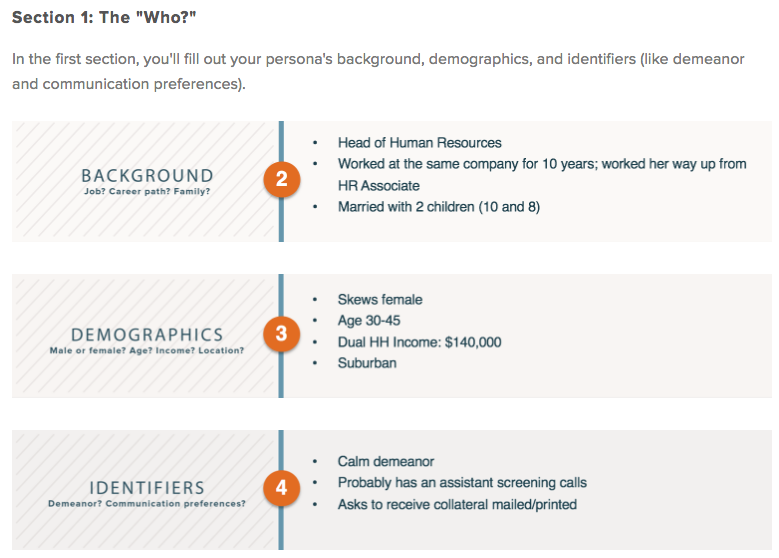 In the first section, you'll fill out your persona's background, demographics, and identifiers (like demeanor and communication preferences). Next, you'll fill in your persona's goals and challenges, followed by what your business can do to help them achieve their goals and overcome their challenges. Here's where you can input real quotes from customers and potential customers from the surveys and interviews you conducted for persona research. You can also input common objections -- reasons your ideal buyers have said they wouldn't want to buy your offering. Finally, you can fill in the marketing messaging you want to use for this particular target buyer. How should you describe your offering to this persona? What's your elevator pitch to them? Use this example as a guide to customize your own buyer personas, and use them to organize your audience segments and strengthen your marketing. Want to see how HubSpot’s marketing platform can help you create effective marketing campaigns?